OK so the alarm didn’t go off, or you just fancied a lie in – either way you are LATE for that all important interview or special occasion or you’re a busy mum, you have got to look your best but just don’t have the time and you’re in a dilemma. Don’t panic… I can help you. If you have been following my recent article Bare Faced Beauty you’re halfway there. Here is a quick and easy out of the door NATURAL make-up that takes only two minutes to achieve. 1. Apply a Tinted Moisturiser. This is a 2-in-1 product – a moisturiser and a light foundation. It hydrates skin but still gives a bit of colour & evens out your skin tone but leaves a natural finish. 2. Apply a concealer in areas where needed i.e. under eyes or any imperfections. If you have mature skin, put some around the nasal labial area (nose to mouth) as this softens the line. 3. Apply a face powder, swooping across the T zone, around the cheek area and the chin. Powder keeps your make-up looking fresh all day. 4. With the side of your eyebrow pencil with tiny strokes reinforce your eyebrows. If you’re very fair try using a soft brown eye shadow on the brows, when finished soften with a cotton bud. Then to accentuate the eye brows put a little concealer above and below the brow bone – this looks great. 5. Apply a rose coloured blusher, or near to a natural glow , apply on apple of cheek area using a medium brush and with circular movements. Apply softly and try not to load the brush with too much product. You can always repeat application if you need a little more. You don’t want an 80s harsh line showing. Keep it natural. 6. Apply an eyeliner / pencil as close to upper and lower lashes as possible, then soften with a cotton bud. 7. With your favourite mascara apply one coat to top of lashes then for speed using the tip of the mascara wand move it side to side on lower lashes then separate lashes. 8. With a lip pencil a shade darker than your natural lip colour, follow line of lips and then apply a little lip balm and blot excess with tissue then press lips together this gives a natural look but still accentuates your lips. 9. 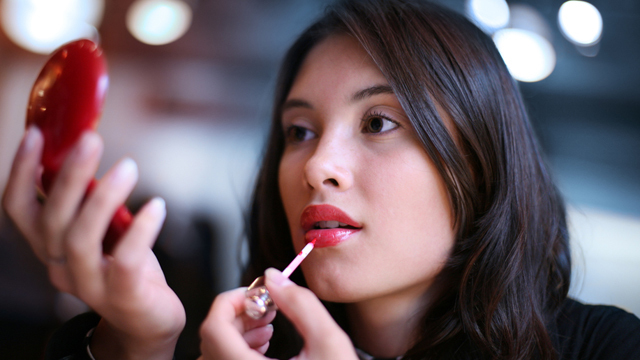 A lip stain lipstick is great and lasts all day if you don’t want to have to keep re-applying lipstick. Cream blusher works well if you don t like powder blusher as it leaves a more dewy look. Apply this before your face powder. Try an easy home-made tinted moisturiser by mixing a little of your face cream with a little foundation. If you can’t be seen at the beach with no make-up on but still want perfect skin try adding a little bit of foundation to your SPF product and you have a little colour as well as protection. For a quick style put your hair in a top knot, it’s a catwalk look and trendy and it only takes a few minutes to do but looks great. If you don’t have time for your Starbucks coffee fix in the morning, a fresh orange juice is a great way to start your day. Your breath remains fresh and it is packed with vitamin C. Your skin will love you for it. Tagged beauty, make-up. Bookmark the permalink.